Planning a menu is very important when you have a party or a get-together at home. When I have Rice varieties like Biryani, Pulav etc., I generally do not prepare curries with lots of masala in it, instead I opt for lighter versions of side dishes like raita and sambhar. On the other hand when I plan to have curries like Bagara Baingan, Chicken, Kofta etc., I opt for Plain white Rice, Jeera Rice, Saffron Rice or Flavoured Rice… also known as Bagara Rice in Hyderabad. 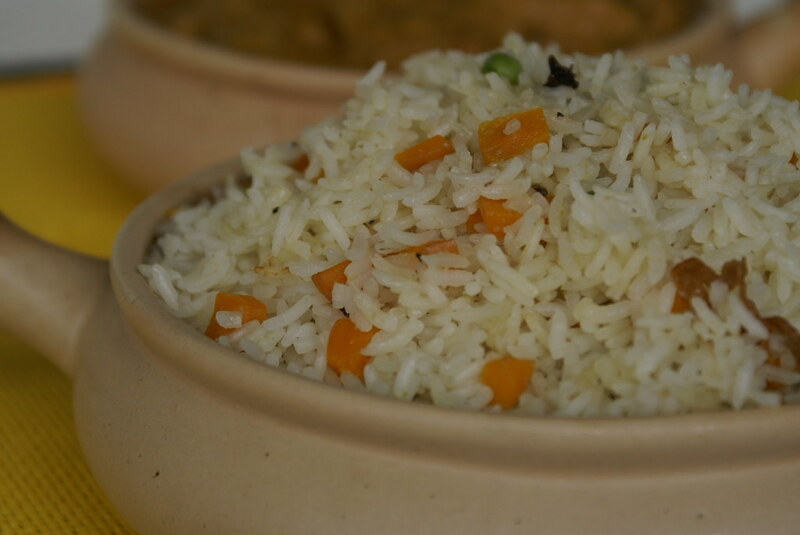 Bagara Rice is very simple and goes with any type of gravies. It does not have lots of masala in it, but just has the flavor and aroma of masala. Veggies are usually not added to it, but I add a few to make it colorful. Heat oil or ghee in a pressure cooker. Add onions(if using), fry for a min and add ginger garlic paste. Add the veggies and fry for a min. Add rice and water. Add salt to taste. Tie all the whole masalas in a muslin cloth or in a tea strainer and drop in the water. Close the pressure cooker and cook as usual till rice is done. Remove the whole masala and Serve hot with any gravies. As I said, it is perfect for parties and its mild flavor compliments with any type of gravy/curry. hello cinnamon… i love Bagara rice… thanks for sharing… howz ur health?take care…. This is a very simple rice dish. Looks so good. YUM!. The picture is so appetizing. Rice looks too good.. tempting..
Nice recipe.got to try this. btw, I am hosting an event called Sunday Snacks, see if you can send in something for that event too..
Nice recipe and love that bowl…!Hope you r doing well. How are you doing??? Health Wise??? I haven’t had rice in awhile and it looks so tempting!!! In gujarat, this kind of pulao/rice is served with guajarati kadhi/dal at the weddings. it pairs beautifully with either one. your bell pepper chutney is pretty unique…will try it out some time. What a great combination of colors and flavors. 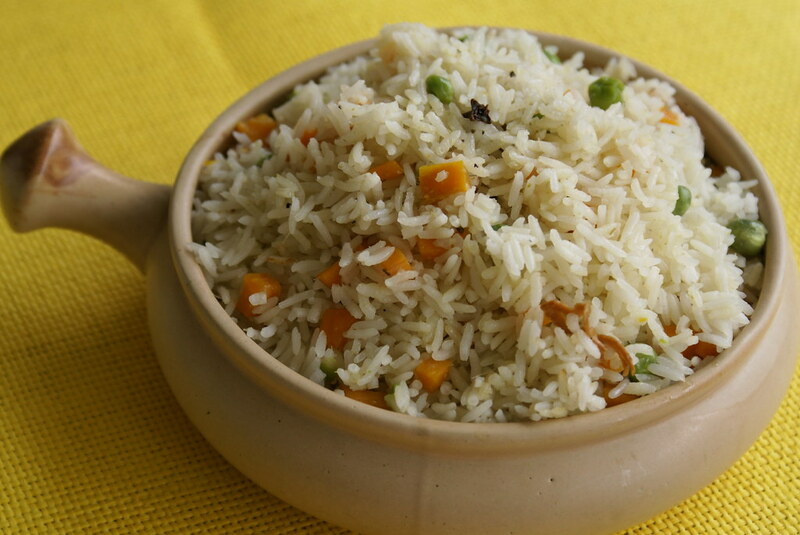 Bagara rice is very simple and flavourful. This dish looks so beautiful, so delicious! Will try it out soon. Thanks so much for sharing.